Believing that he is afflicted by a family curse, a man seeks the help of a 19th century doctor who treats his notion of vampirism as an affliction of the mind. California 1866 – Lesley Parker awakens in the middle of the night to find her mother stabbed to death. Lesley’s father holds a knife and tells his daughter that she must die, too. After a brief chase, Lesley’s father falls down the stairs and accidentally stabs himself in the heart. 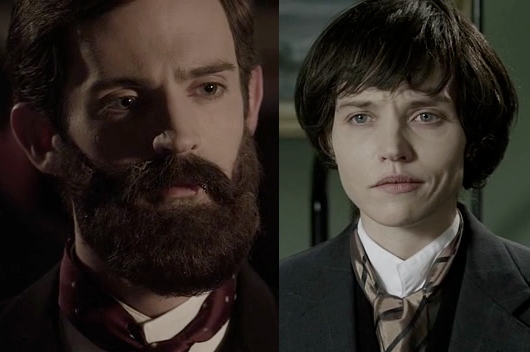 France 1885 – Now a doctor, Lesley dresses as a man so that she can attend classes on a special hypnosis therapy technique taught by Dr. Charcot. In the lecture, Lesley reads a newspaper account of a supposed vampire attack and makes friends with classmate Sigmund Freud, who sees through her disguise but keeps her secret. Charcot tells his students that they will be following one of his cases from the beginning. His latest patient believes that he suffers from an ancient family curse that is turning him into a vampire. Lesley and Freud have dinner as colleagues. Lesley tells Freud that she specializes in treating phobias, and she hopes to use Charcot’s hypnosis techniques in her work when she returns to the United States. She also confides that she has had a personal fear of the dark ever since the death of her parents. Two Months Later – A woman walking alone is attacked by a cloaked assailant. Lesley and Freud have another dinner together. Freud sees an old acquaintance named Val Drakul and introduces him to Lesley. Val takes a liking to Lesley. The next day, Charcot and Freud reveal to Lesley that Val Drakul is Charcot’s patient, although Freud was unaware until dinner. Believing that Val’s condition is not physical, Charcot asks Lesley if she will take Val’s case. Freud convinces her. Lesley meets Val’s parents, Baron and Baroness Drakul. She then consults with Val and asks to meet his cousins so that she can learn more about his family background. Val takes Lesley to a Paris theater where she meets Guy Krusek and his sister Marcia. Guy reveals that their family is descended from Vlad Tepes. Guy mentions that he knows Lesley is taking Val to San Francisco. He and Marci plan to go, too. Val points out a pattern between his blackouts and the strange local murders. Marci admits that she has claustrophobia and asks for treatment, as well. Lesley reveals to the Kruseks that she is really a woman. Before she leaves Paris, Lesley tells Freud that she has secured an estate in San Francisco from an agoraphobic woman and plans to use the location for group therapy sessions. Freud asks her if she is romantically interested in Val, but she plays coy. San Francisco 1885 – Lesley meets the reclusive Mrs. Annabel Lee. Formerly from Georgia, Mrs. Lee claims to be agoraphobic since her husband was shot to death. Her housekeeper is also her disobedient ward, Elizabeth. Elizabeth tells Lesley that Mrs. Lee sleeps in a coffin with a glass lid so that she can feel closer to her husband. After a fencing match, Val reveals that his latest blackout coincides with a local murder, but he does not want to believe he is responsible. Lesley asks him how he can be in the sun if he is a vampire. He refutes sunlight being harmful as a myth. Lesley and Val share a kiss before Elizabeth interrupts. Lesley tells Val that she received correspondence from I.M. Casey, a supposed associate of Dr. Charcot’s who wishes to witness her employing Charcot’s methods. Val is suspicious of Casey. Casey arrives for the first group therapy session with Lesley, Val, Mrs. Lee, and the Kruseks. Also in attendance are Albert Simmons, who has a fear of knives, and Roberta Williams, who is afraid of heights. When the guests leave after the session, Val attempts to kiss Lesley, but she tells him that they need to be discreet. Elizabeth makes a pass at Lesley by complimenting her skin. Val returns and takes Lesley to dinner. Mrs. Lee admonishes Elizabeth for hitting on Lesley. Elizabeth threatens to reveal that Mrs. Lee actually killed her husband when she discovered that he fathered Elizabeth with his mistress. Casey tells Lesley that he is actually a police inspector investigating Val. Val’s parents were murdered the night before Val and Lesley left for San Francisco, but Val does not yet know. A series of murders in London also occurred while Val was enrolled in university there. Casey asks Lesley to not tell Val that he is being monitored, as Casey and an associate plan to follow Val if he ever leaves the house. Lesley puts Val under hypnosis and asks about the relationship with his parents. Lesley learns that Val was abused by his father and that Baron Drakul used the story of the family curse as a means of controlling his son. During the next group therapy session, Marci confronts her claustrophobia by spending time inside Mrs. Lee’s coffin while Lesley supervises. When the power goes out, Lesley collapses from her fear of the dark. Marci dies after the coffin lid mysteriously locks. Lesley wonders aloud if Val locked the coffin while she was unconscious. Mr. Simmons takes a horse from the stable to fetch the authorities. Mrs. Lee points out that whoever sabotaged the lock may have been trying to kill her. Mr. Simmons returns empty-handed. Everyone has to stay the night since the roads are washed out. Casey tells Lesley that he thinks there are two murderers because Marci’s death does not match the others. Guy, Val, and Lesley discuss Marci’s murder. Guy wonders if Casey might be involved. Mrs. Lee proposes conducting a séance with Casey to contact Marci. Lesley refuses, but is overruled by the others. Everyone but Guy attends the séance. Floating lights appear during the proceedings. Roberta hears a voice telling her that she can fly. In a trance, she jumps out a window. Everyone rushes to the window and sees Guy standing over Roberta’s body. Mr. Simmons is killed in the house while the others are outside. When everyone returns to the parlor, Guy reveals himself to be the real vampire when he takes Elizabeth hostage. Lesley and Val return to Paris and confer with Freud. Freud theorizes that they are suffering from group hypnosis. Guy appears in the restaurant where they are meeting. Val and Freud chase him while Casey appears and hypnotizes Lesley. Lesley awakens to find herself captured by Casey. She realizes that he committed the murders and hypnotized all of the others. Casey reveals himself as the first victim of Vlad Tepes. He claims that he has only killed other vampires, but he cannot kill himself. He wants Lesley to kill him and then kill Val and Guy. Casey gives her a sword and forces her to thrust it into his chest. Lesley is forced to confront her fear of the dark as she descends into the basement to find Val. Lesley finds Freud unconscious and Val on the ground. Guy confronts Val and Lesley. Following a brief fight, Lesley kills Guy with the sword, but she is unable to turn the blade on Val. Val kisses her instead. Freud recovers, but refuses to believe in vampires. It is a bold move for an independent feature filmed in Texas with a low budget to tackle a period piece that takes place in another country and features dialogue in both French and English. Bold, although not entirely effective. The bravery of “Phobia” to go big on its ideas has an uphill battle staying within the confines of its restricted budget and limited production resources. “Phobia” bears the made-for-TV aroma of a movie that would fit nicely as the lead-in to a Craigslist killer dramatization on syndicated basic cable. Not entirely a horror film per se, “Phobia” is more of a romance and psychological drama that also includes a possible vampire in its plotline. After the harrowing stabbing deaths of her parents inspire a lifelong fear of the dark, Lesley Parker becomes a psychiatrist in order to help those like herself overcome their phobias. Disguising herself in a Fab Four moptop that would not even fool Ray Charles, Lesley travels to Paris in 1885 where she learns the hypnosis therapy techniques of Dr. Charcot in an all-male classroom alongside fellow student Sigmund Freud. Dr. Freud has recently emerged from the same Makeup Department as Dr. Parker by donning a fake beard that also came from the discount aisle at Spencer’s Gifts. Charcot and Freud introduce Lesley to Val Drakul. A descendent of Vlad Tepes, Val is convinced that his blackouts and a rash of bloody local slayings indicate that he has fallen victim to the family curse. Intent on proving that Val’s suspicions of vampirism are merely psychosomatic, Lesley brings Val back to California with her for treatment. With Val enrolled in Lesley’s group therapy for phobia-afflicted minds, the treatment sessions melt into a Victorian era whodunit when slashed necks make the jump across the pond along with doctor and patient. Paced like a pendulum that swings slowly but surely, “Phobia” packs so many loosely related distractions into its runtime that the core storyline is lost like a needle in a haystack. Equal parts romance, gothic intrigue, psychobabble, and investigative procedural clash together for a movie that tries, but struggles, to be something more substantial that a murder mystery dinner party recreation or live action version of the board game Clue. “Phobia” has as much working against it as it does working for it. The already mentioned fake beard on Matt Moore’s Sigmund Freud is laugh out loud embarrassing for the Makeup Department. Ditto on Erica Leerhsen’s disguise for passing herself off as male. Putting a Moe Howard wig over her feminine features is about as convincing as Superman wearing glasses and passing himself off as Clark Kent. However, the costuming is outstanding given the scope of the production. The period garb and gowns make up for a lot of the ground lost by confined sets that have a hard time standing in for Paris streets, lecture halls, and cafés. In the big picture, there are enough hits and misses to balance out for a passable setting that is not believably realistic, but it does enough to be acceptable for this scale of film. The script, the acting, and the characterizations can be lumped into that same mixed bag. The story wanders in so many directions that it dizzies itself by spinning too many plates at once. The heartbeat of the plot involves the doctor-patient relationship between Dr. Parker and Val Drakul. It aims to be a passionate love affair, except it begins so abruptly that chemistry never has a moment to develop between the two players. Standing in the way of the focus on the lovers is a too full roster of other patients also treated by Dr. Parker. In total, seven more men and women join Val for Lesley’s group therapy sessions. Some personalities are more important to the plot than others, but everyone has a full backstory whether it goes anywhere or not. Multiply those moments with various scenes of heads talking theory about neuroses and psychiatric treatment, and “Phobia” meanders into unnecessary exposition territory that subtracts more than it adds to the overall narrative. By wearing too many hats, “Phobia” underwhelms as a romance, as a thriller, and as a satisfying movie in general. The screenplay loses track of its purpose with convoluted subplots left unresolved and unimportant. Inconsistent production design lends the look of a community theater stage play that detracts from the serious tone. And talented actors deliver performances that might have improved with an occasional second take, but settle for being uneven. “Phobia” puts its best foot forward to create mood on a shoestring. Sometimes, it is too much, such as the flickering candlelight and flashing lightning that is laid on thicker than London fog. But for those other times, those good intentions are not enough to save the film from categorization as average. September 11, 2013 by Ian Sedensky.